Microsoft major reorganization memo leaks: "One Strategy, One Company"
We had heard that Microsoft CEO Steve Ballmer was working on a major reorganization plan at Microsoft, which would fundamentally change how the company was structured, and bring the Windows desktop and Windows mobile teams closer together. Today, AllThingsD has published an internal memo by Ballmer that explains the plan before the official announcement. Ballmer starts out the memo by patting himself on the back for his "three screens and a cloud" vision, and reiterates that must be the plan for Microsoft, saying "our products and services should operate as one experience across every device." This is what we've long expected from Windows because of the much marketed "shared core" between Windows 8 and Windows Phone 8, and the unified UI, but it looks like we're really going to see the convergence from here on. Ultimately, Ballmer wants the company to "strive for single experience for everything in a person’s life that matters", and expects that the reorganization will help the company innovate faster and more efficiently. To do that, Ballmer is calling for Microsoft to rally "behind a single strategy as one company." Basically, Ballmer is echoing ideas that we've heard in the past from Apple, Google, and Sony, saying that the company can't just be a collection of teams and divisions, but a unified group working towards a common goal. We thought this was the plan from the announcement of Windows Phone 8, but apparently not. Ballmer expressly says that "All parts of the company will share and contribute to the success of core offerings, like Windows, Windows Phone, Xbox, Surface, Office 365 and our EA offer, Bing, Skype, Dynamics, Azure and our servers." That kind of cross-pollination is difficult with the current structure, so the plan is to organize the company by function, rather than by product. The functions being: Engineering (including supply chain and datacenters), Marketing, Business Development and Evangelism, Advanced Strategy and Research, Finance, HR, Legal, and COO (including field, support, commercial operations and IT). For our purposes, we're going to focus solely on the Engineering because that is really the entire product line. Engineering will be split into four divisions: OS, Apps, Cloud, and Devices. Current teams will continue to focus on what is in the pipeline right now, but Ballmer expects the full transition to the new organization by the end of the year. At that time, Terry Myerson, currently the corporate vice president of the Windows Phone Division, will head up the Operating Systems Engineering Group, which will cover work on all Microsoft platforms from Windows Phone to Windows and Xbox. Julie Larson-Green, who has been the head of the Windows division, will take over the Devices and Studios Engineering Group, which will deal with all hardware and supply chain issues (this is the Devices part) as well as the entertainment services (Studios) like Xbox Live, Xbox Music, etc. Qi Lu, who has been president of Microsoft's Online Services Division, will become head of the Applications and Services Engineering Group, which will focus on Microsoft's software library in "productivity, communication, search and other information categories." This seems to mean the group will include Office, Bing, Skype, etc. And, Satya Nadella, who has been president of Microsoft Corporation's Server and Tools Business, will take over the Cloud and Enterprise Engineering Group, which will focus on "back-end technologies like datacenter, database and our specific technologies for enterprise IT scenarios and development tools." Obviously, there are a lot of other groups being created, but as we said, we're just focusing on the ones that most directly affect what we report on a daily basis here. There will also be some high profile employees moving around in and leaving the company. Kurt DelBene, now the former president of the Microsoft Office Division, will be leaving the company. Craig Mundie will "devote 100% of his time" to working on a special project directly with Ballmer. Rick Rashid will move away from his role as head of Microsoft Research to work in the OS group. Ultimately, Ballmer doesn't see the "what" of Microsoft's plan changing, merely the "how" of actually getting it done. Ballmer expects that this reorganization will help the company to be more nimble, more collaborative, while making communication, and decision-making easier processes. The end goal is still to build a convergent experience for users where they will get the same experience from a Windows Phone device as they do a Windows desktop, and all apps from Bing to Skype have a cohesive vision behind them as well. Microsoft also seems to be focusing more on hardware, so we should definitely expect more than just Xbox and Surface tablets from the company in the future, as Ballmer is focused on offering a "Family of Devices", which sounds quite a bit like there has been some Nokia influence there. Ballmer is going all out to get his troops excited for this new structure, saying, "One strategy, united together, with great communication, decisiveness and positive energy is the only way to fly." Ballmer is an excitable guy, and he definitely seems amped up for this plan. Microsoft has a clear vision of where it wants to go, and now it has a new process to get there. We may not see the fruits of this new corporate structure until next year at the earliest, but it should be interesting to watch. For the full memo from Ballmer, check the Press Release section. Be warned, it is a looong one. Process wise, each major initiative of the company (product or high-value scenario) will have a team that spans groups to ensure we succeed against our goals. Our strategy will drive what initiatives we agree and commit to at my staff meetings. Most disciplines and product groups will have a core that delivers key technology or services and then a piece that lines up with the initiatives. Each major initiative will have a champion who will be a direct report to me or one of my direct reports. The champion will organize to drive a cross-company team for success, but my whole staff will have commitment to the initiative’s success. We will also have outgrowths on those major initiatives that may involve only a single product group. Certainly, succeeding with mobile devices, Windows, Office 365 and Azure will be foundational. Xbox and Bing will also be key future contributors to financial success. Our focus on high-value activities — serious fun, meetings, tasks, research, information assurance and IT/Dev workloads — also will get top-level championship. Great, now if he would just remove himself as CEO and dump those hideous tiles on his way out, all will be peachy. 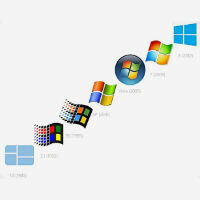 LOL the first and last windows logo look almost the same!! Yeah Apple and MS are also going the same way. "the company can't just be a collection of teams and divisions, but a unified group working towards a common goal" Back to the future!!! there are so many one HTC ONE ONE SONY MICROSOFT ONE it's lucky that Apple doesnt get involved. They already have "OnePhone", it's the same damn one phone every year. I'm ready for a change. You just won my vote for post of the day. Look at the picture......!!!! It begins with a monochrome blue logo,,,,,,,, and ends with a monochrome blue logo. And all in the middle is a colorful logo. What is the meaning of all of this? That means install Linux, Dorothy, cause' productivity - is going bye bye.